Crunchy biscuits made with wholegrain oats, barley and cinnamon with an almond butter flavoured filling. 100% wholegrain oats and barley. Filling made with real almond butter. High in fibre. No colours or preservatives. No artificial flavours. Suitable for vegetarians. Nature Valley Biscuits made with natural wholegrain oats and barley, filled with deliciously smooth and real nut butter Nature Valley Nut Butter Biscuits are the perfect on the go snack for any time of day Why not also try Nature Valley Crunchy Oats & Honey Cereal Bars or Nature Valley Protein Peanut & Chocolate Cereal Bars? 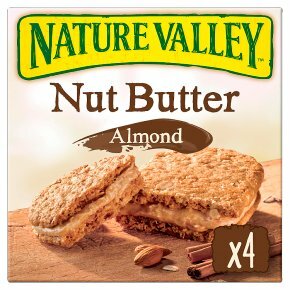 Go ahead, try our Nature Valley Nut Butter Biscuits: two crunchy cinnamon biscuits, made with 100% wholegrain oats and barley, containing a deliciously smooth filling made with Real Almond butter - the perfect on-the-go companion to start your day! !